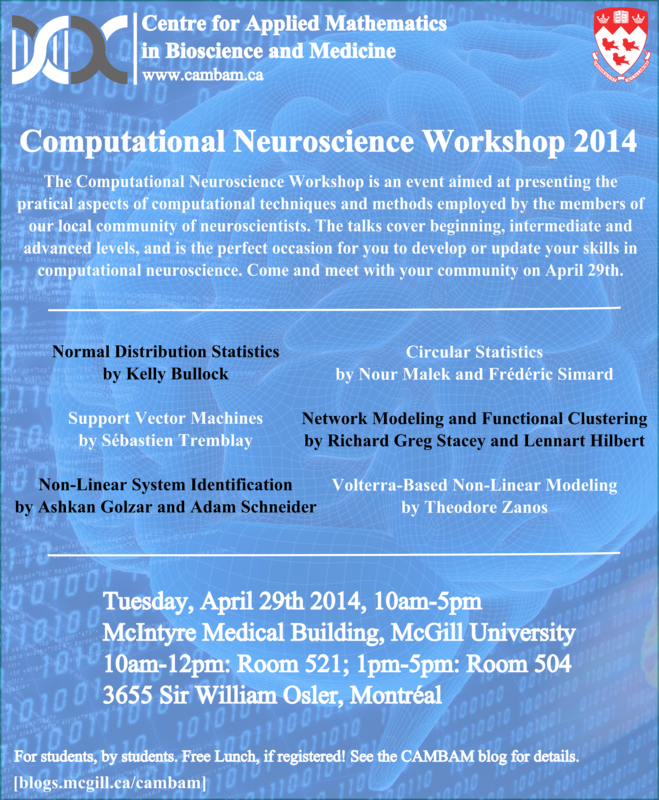 Over the course of the last few months, a team of McGill neuroscience students and post-docs have been preparing talks on the topic of computational neuroscience aimed at explaining computational techniques that they are applying to their data, the results of which will be presented at the Computational Neuroscience Workshop 2014. Through the workshop, you will learn about the practical aspects of analysis tools and modeling techniques that are commonly used in the field of neuroscience, explained in layman terms and centered on practical considerations. The goal is to provide a refined description that cuts through the wood to keep the explanations quick and simple. It is an occasion to rapidly cover several approaches, before you decide to incorporate them in your study, if it has the potential to bring it to a better end. This year, the event will take place on Tuesday, April 29th, on the 5th floor of the McIntyre Medical Building (rm. 521 and 504). It will start at 10h00am with the morning cookies and waking up coffee. The first two talks will take place in the morning (10h30-12h00) before moving on with the lunch break (12h00-1h00) which will feature social pizza. Students who have registered for lunch will have priority over the pizza, but the lunch is free of charge, see below for registration details. In the afternoon, 4 more talks will be presented (1h00-2h30 and 3h00-4h30), interleaved by a coffee break at 2h30 (see details schedule below). This event is organized by us and is for us! Come numerous! For the lunch registration, you need to add your name to the doodle list targeted by this link. Adding your name registers you for a meal, while the answer you provide determines whether you prefer a vegetarian meal or not. Answer Yes for the vegetarian option and No for the non-vegetarian option. The result of this pool will be used to plan for the correct amount of food. Published by Frédéric Simard on April 7, 2014 at 3:25 pm under Announcements, CAMBAM, Events, Student community. I am a U1 undergrad in Quantitative Biology interested in this workshop. However, would this event be suitable for beginners with not much background in statistics? Yes, in fact the two talks normal distribution statistics and circular statistics are targeted specificaly for beginners. As for the other talks, you might not get the whole of it, but you’ll definitely get the big picture. In any case, you’ll get to hear grad students talking about the tools they use in their research. I will sign up and see you there! Also quick suggestion, you might want to promote this event more! Thanks for the suggestion. We are very open and we welcome everyone, but I would tell you, however, that the goal of this event is not necessarily to gather the most people. Instead we aim to offer a moment for everyone to discuss freely and interact together. I’m afraid that if too many people were to come, the event would lose of its intimacy and not everyone might have the chance to express themselves. You will see how convivial the workshop is.